Writing Business E-Mail? Do You Follow These 10 Etiquettes? Writing a business e-mail is not about using lofty wordings and sentences; as much it is about using short and simplified language to put across your point, in a rather formal or semi-formal manner, as the case may be. Especially, a formal approach to your business letter gains significance as you might be dealing with a customer for the very first time, which will require a prompt and precise reply to convey your message with sincerity and faithfulness. However, if you’re in a long standing business relation with your existing customer, and share a friendly environment with them, you might as well switch to semi-formal approach of communication in a bid to exhibit your level of comfort, looking at the thriving history of dealing with the said party. Coming back specifically to important business etiquettes while formulating a communication e-mail letter – be it a price quotation, replying a business inquiry, initiating a business proposal or intimating dispatch advice – directed to a customer. In this age of e-mail jungle and limited processing time, the subject line comes across as the single most important aspect that carries through your message along with the pack of information to your target customer. Keep it short and precise. If your e-mail subject line is precise, it will also serve your customer’s requirement for searching your e-mail for future references, from the tons of e-mails junk already existing in his inbox. We all know the significance of the correct spelling in the ‘To’ section of the e-mail to reach the desired recipient promptly. However, it is also important to understand the etiquette of tagging the same e-mail with respect to ‘CC’ and ‘BCC’ recipients, under different circumstances. For example, you receive an enquiry from the customer which enlists various people to whom the letter has been forwarded as ‘CC’. In such cases, while submitting the quotation for your offering, it is desirable on your behalf to send a CC of your list price to all such e-mail IDs, to keep them updated of the development. A Proper opening of a business letter would require a brief e-mail Subject Line to convey your main purpose of communication, to cut the story in short. Now, coming to notation of the person to whom the e-mail is to be forwarded to. A professional business e-mail would not warrant an informal opening such as ‘Hi, Raju Sir”. A preferred notation at this juncture would be “Kind Attn. : Mr.Raju” or “Dear Mr.Raju”. Even a plain “Dear Sir” would serve the purpose. First impression is the last impression. The way you open your conversation in the e-mail, speaks a lot about your attitude and interest in striking a business deal with your customer. But, in any case, a reply is a must once you receive e-mail from a customer. If that needs you to buy some time to process the requirement of the party, simply acknowledge the receipt of the e-mail without any delay. Alongside, you might also want to assure the customer that his inquiry will get its due attention it deserves, once its processing is complete at your end. Now is the time to get to the trunk of the business matter – start with providing the crux of your information and clarifications that may be sought by the customer. You might also want to attach a detailed document file along with the e-mail for the customer’s review, to ensure that the main body of your e-mail stays brief and free of minutest of information clutter. To end with, a courteous thank you, along with a departing reminder note, if any, to the customer would leave a good impression about you and your organization. In fact, a good communication e-mail has strength to elicit a response from the reader, as a reward for your courtesy, effort and host of information disseminated by you. That’s the least you can expect, even if you are not headed towards striking a deal with the party. After doing all the hard work, nobody would not like to scurry the opportunity so created by writing such a wonderful e-mail. Do not forget to specify your name, designation, Company’s name, address and contact details. For your convenience, you can attach these details in your e-mail signature that is appended at the end of all outgoing messages, so that you do not have to type it again and again in every new mail. Specifying your designation alongside your name is equally important, as a prospective customer would always be interested to learn what position and weight you hold in the firm, for all the say you did to him in your e-mail. Many organizations have policy to sign off with a disclaimer to protect the entity from legal liabilities, confidentiality clauses and transmission errors of the e-mail. Such messages could be marked in smaller font sizes than usual, yet readable, in order to maintain essence of the crux of your e-mail. Now that you are ready to shoot your e-mail to the customer, make a last ditch effort to proof read your e-mail for spelling and grammatical errors, rather than sending follow-up face saving e-mails to regret your mistakes at a later stage. Often, there might not be any grammatical errors once the proof-reading is done, but yet some of the sentences might not sound proper or may not communicate precisely what you need to tell them. Such errors are best eliminated on going through the e-mail at least once or twice before finalizing. 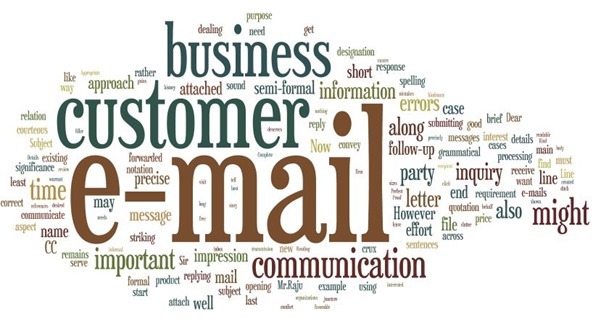 An important aspect of e-mail communication is the follow-up of the same, in case your e-mail has not elicited a favorable feedback, or worse still – no response at all, a follow-up effort is a must in trying to convince the customer about your product or service or any other patchy issue at hand. As a contra strategy, if nothing works, this is the time to witch on to semi-formal e-mail approach in persuading the customer in your sway. If needed, a direct communication by phone or personal visit remains an option, if written communication is a hindrance in developing a new business relation, in selective cases. Ixigo Launches Bus Ticket Search Android Mobile App! Combining (2) Appropriate Recipients and (9) Proof Reading, ensure that unintended recipients do not appear in TO/CC/BCC, and, conversely, intended recipients are not missed out! Excellent compilation of all the important issues to writing a business mail. Contractual issues of what is written : Suppose you receive an enquiry for some material, which you can provide but you do not have in your stock, you reply should be in such a way that you write about it but they won’t notice it. You are not cheating the customer but merely shifting his focus. For example, you can say your cost with normal shipping is X and with air freight will be Y. You also write specific payment terms etc. The customer’s focus shifts to cost related issues and he will overlook the fact that the material is not ex-stock. By the time the customer decides which mode of transport, you can have it in your stock. Another example is suppose the customer is looking for some SS Pipe fittings, and you do not have in your stock. Offer some alternatives and show the alternative is equivalent in grade but with cost effective. The customer will discuss with their QC and by the time he comes back and asks you to quote for the exact material, you will have it in your stock. Another important issue in writing Business mails is the size of the sentense and paragraph. The sentence should not exceed more than 10-15 words. You might have seen some court proceedings and the legal documents. An entire para consuming half the page is a single sentense. By the time any one reaches the second line in a sentense, the contractual sense is lost. A sentense should ieallly be around a line and a para should not exceed 4 or 5 lines. If the para exceeds 4 – 5 lines, the cutomer looses interest in reading the entire para. He will go to the next topic in the mail. In support of my above comment about the size of the para, lets see how many readers read my entire comment before reading this comment. Your 2cents are so helpful.